This kinda feels like a doing a play group, but then again it kinda feels like doing your own thing! Since this is not a class, you may come and go as you please! As we have found with our own young son, there is an immense amount of coordination, agility and balance that can be sped along at a young age with the help of a couple trampolines and a foam pit! As your child uses the equipment our facility has to offer, they will learn to be less timid and more self-confident when they are required to "do it on their own". We set up many of the same inflatables as we do for our Birthday Parties, so your child will have plenty of things to experience. And don't forget to ask for a Punch Card, and earn admission after 5 visits! 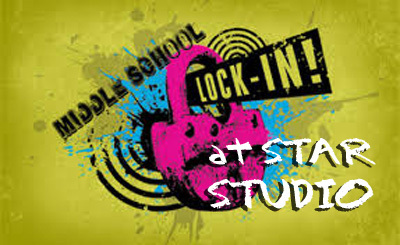 So many of Star Studio students and non-students, just wanna come have some fun without all the "learning"! So we created this fully supervised weekly time for kids just like that. Come and work on that tumbling or trampoline skill that you love to do in class or just play around with your friends-it’s your night!! From the start of the night to the very end, we have something going on. There are many popular activities like Obstacle Course Races or one of our trademark games like: High Jump, Find the Cube or Musical Numbers. Participation with the games is not required, and is interspersed throughout frequent free-play. With the opening of our new activities room upstairs, we can now have the Gaga Pit and Dodgeball running all night long! Don’t worry about getting hungry or thirsty, we have concessions available throughout the night. However, we must warn you about your child coming, they might just get addicted! And don't forget to ask for a Punch Card, and earn admission after 5 visits! There are less organized games than the Elementary School Open Gym has, but that is how these kids like it! So many of Star Studio students and non-students, just wanna come have some fun without all the "learning"! So we created this fully supervised weekly time for kids just like that. Come and work on that tumbling or trampoline skill that you love to do in class or just play around with your friends-it’s your night!! There's always something going on, from Dodge ball to Best Trick Contest. Another one of our popular trademark games is High Jump, where the winner always get a prize! Participation with the games is not required, and is interspersed throughout frequent free-play. With the opening of our new activities room upstairs, we can now have the Gaga Pit and Dodgeball running all night long!Don’t worry about getting hungry or thirsty, we have concessions available throughout the night. However, we must warn you about coming: as with many of the kids we see each week, you might just get addicted! And don't forget to ask for a Punch Card, and earn admission after 5 visits!